The Toronto Maple Leafs would like to forget 2015-2016 for the most part. They finished with a 29-42-11 record, the worst record in the National Hockey League. The last place finish put them in position to win the NHL Draft Lottery, which they did. And with that top selection, the Maple Leafs went on to draft the one and only Auston Matthews. A lot is riding on the 19-year-old, who is charted to be the team’s first considerable top line centre since Mats Sundin. Projections suggest that the California-born player should emerge as an elite scorer. He solidified this in his performance in the World Cup of Hockey, where he put up three points in three games for Team North America. Toronto goes forward with Matthews and with the vision of Brendan Shanahan, which has provided full support for general manager Lou Lamoriello and head coach Mike Babcock. The latter has been proving himself in his World Cup handling of Team Canada, while the former has been employing the discipline and structure needed to finally get this rebuild to pay off. 25-year-old Nazem Kadri had 45 points in 76 games last season and is fully capable in the top spot down the middle. Four of his 17 goals came on the power play and the London native averaged 18:16 of ice time a game. He has great instincts and plays a creative game, but his size can be an issue and his defensive side could use an upgrade. Leo Komarov had 36 points in 67 games and averaged 17:50 of ice time a game. He is a feisty forward and would probably find himself in the bottom six on most rosters, but the Maple Leafs have found a way to elevate his presence and he’s become a nice fit up front. Komarov surprised with 19 goals last season, plus he earned himself a World Cup spot on Team Finland. Matthews is expected to make an immediate impact in the NHL, but the job for Toronto is to figure out where to put him. He’s likely to centre the second line out of the gate, which still puts him in line to hook up with plenty of good wingers. That said, there are still some issues with the roster and Matthews may not explode with offensive fury. He’s still projected to be a strong franchise player, but it may be wise to temper expectations. Russian winger Nikita Soshnikov is a compelling fit down the right side. The 22-year-old saw action in 11 games last season and picked up five points. He’s not as big or strong as the Maple Leafs would like, but it’s hard to ignore his offensive prowess. William Nylander is another part of the young nucleus. He’s a sublime playmaker and he put up 13 points in 22 games last season. 22-year-old Morgan Rielly has the wheels to deal from his own end and the Maple Leafs like what he brings to the table. He can quarterback the power play and fuel the rush as a fourth forward. Rielly had 36 points in 82 games last season and averaged 23:13 of ice time a game. He cracked off 167 shots on goal and likes to create offensive opportunities. Jake Gardiner had 31 points in 79 games, with an average of 20:37 of ice time a game. The 26-year-old can do a lot of the things Rielly does and he gives Toronto another option to join the attack from their own end, plus he can quarterback the man-advantage. Unfortunately, Gardiner has a tendency to fall apart without the puck and he’s prone to defensive errors. 31-year-old Matt Hunwick moves the puck and skates well. He also logs big minutes, with an average of 22:33 a game last season. He scored just 10 points in 60 games, but his mobility makes him an option. The addition of Roman Polak gives Toronto a nice stay-at-home blueliner. The 30-year-old plays a steady game and can clear the crease. Expectations are high for goalie Frederik Andersen, who split the share with John Gibson in Anaheim last season and is now set to operate as the starter in Toronto. He was 22-9-7 last season with a 2.30 goals against average. The 26-year-old has natural ability and should be a terrific fit in Babcock’s system. He’ll see a lot of starts, however, and that might push him in terms of consistency. Swedish netminder Jhonas Enroth is slated as the backup after the Maple Leafs picked him up as a free agent in August. He is an agile and quick goalie, even if he is a bit undersized. He went 7-5-1 with the Los Angeles Kings last season and knows how to play under pressure. 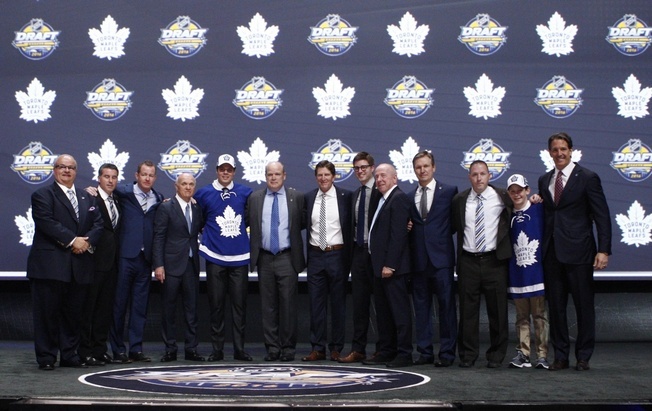 The Maple Leafs have done well at the NHL Entry Draft over the past while and it’s time for their strategy to pay dividends. With Matthews and Nylander in the tank, there are some other players in the mix worth looking at. 19-year-old Mitch Marner is at the top of many lists. The 19-year-old was the most decorated player in junior last season and took London to the Memorial Cup. He’s a versatile player and he knows how to put the puck in the net. Defenceman Nikita Zaitsev could be a possibility to crack the top six. He saw action with Russia in the IIHF World Championship and was named to the all-star team. He’s an excellent puck-mover and he can put up good numbers offensively, plus he owns a solid frame. Auston Matthews has given the Maple Leafs new life, but he’ll have to prove he can weather the expectations in one of hockey’s most impatient markets. Toronto will have to give the young core time and space to operate and that could prove challenging. But if things develop according to plan, this could be one of the most exciting young franchises in the league.